VascuLife® EnGS-Mv Medium (containing Endothelial Cell Growth Supplement) is optimized for the culture of Human Microvascular Endothelial Cells. VascuLife® culture medium supports the rapid proliferation of these cells in a 5% serum environment. 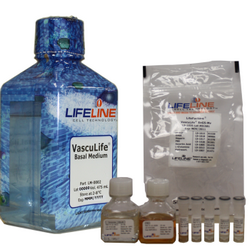 VascuLife® EnGS-Mv is offered in a kit format, composed of basal medium (in a light-protected 500 mL bottle) and associated supplements and growth factors called “LifeFactors®” (packaged in a convenient gas-impermeable pouch for easy storage). This kit allows you to prepare fresh complete medium in your laboratory, extending shelf life and enhancing performance.